No looking back on this one-owner 1968 Mustang 2+2 fastback. Janice T. was 22 years old when a Presidential Blue 1968 Mustang 2+2 became her first new car. She traded in her red on white 1963 Buick Skylark convertible on the day she grabbed this pony car’s $3,200 payment book. 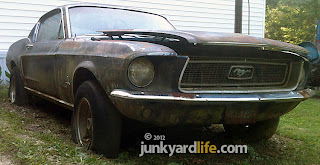 Her 'Stang was a stunner back in the day and still stops people in their tracks wanting to buy it. "You can look, but it will never be for sale." Let's take a look. Carroll Shelby designed the fastback Mustang to compete in the marketplace with Corvette buyers. Walk around this parked pony car just one time and the urge to own a 2+2 Mustang is overwhelming. This car has a menacing stance, like it's ready to pounce. 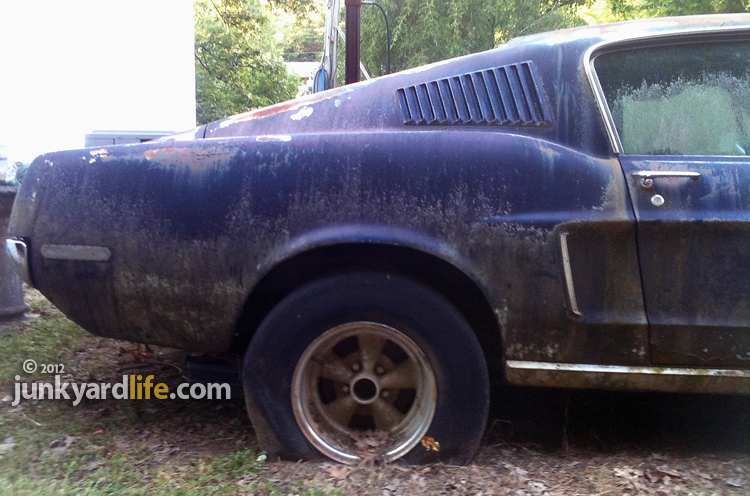 I’ve never owned a Mustang and now I know that I should, and will own an early fastback. I don’t even mind the subtle signs of rust from years of weathering storms unsheltered. The fastback's light blue interior is in great shape and holds a surprise bigger than that set original 1968 hubcaps in the back seat. Janice wheeled her Mustang 2+2 from a bench seat! 1967-1968 Mustang 2+2s gained legendary status due to the high speed heroics that unfolded onscreen in the 1968 movie "Bullitt." Trim tag on the door jam of this 1968 Mustang. 1968 was the first year for the script 'Mustang' emblem on the fender. This one is equipped with a 289-V8. How to "Bullitt" your Mustang is a good reference site for building a replica of the Fastback Steve McQueen thrashed in "Bullitt." You will learn that McQueen ditched the stock steering wheel for a 1967 Shelby Mustang wood wheel wrapped in black leather. The sweeping lines of the 1967-1968 Mustang 2+2 fastbacks gained fame in the movie "Bullitt." 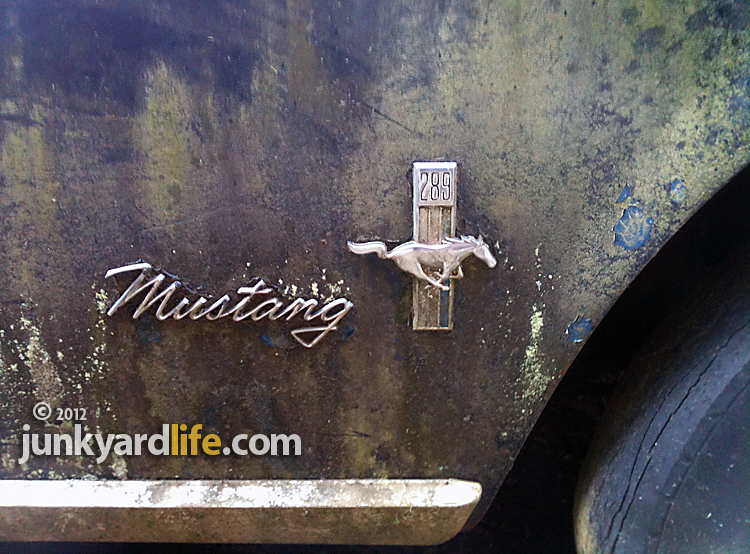 Ford made few changes to the 1968 model Mustangs. The 'FORD' letters were eliminated from the edge of the hood. 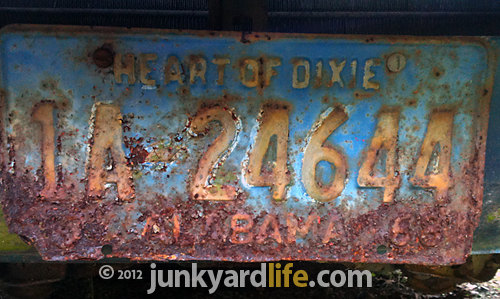 The original 1968 Alabama license plate adorns the front of Janice's fastback Mustang. Know of a junkyard I need to visit or want to send me photos and info about a car or junkyard? Send emails to junkyardbull@gmail.com. Ron’s Colorful Firebird Request: We Need Your Pontiac Skybird, Redbird, Yellowbird Stories! 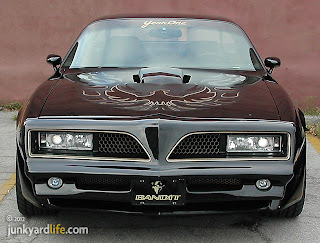 Pontiac Skybird or Sky Bird? Either way its Lombard Blue code 21. 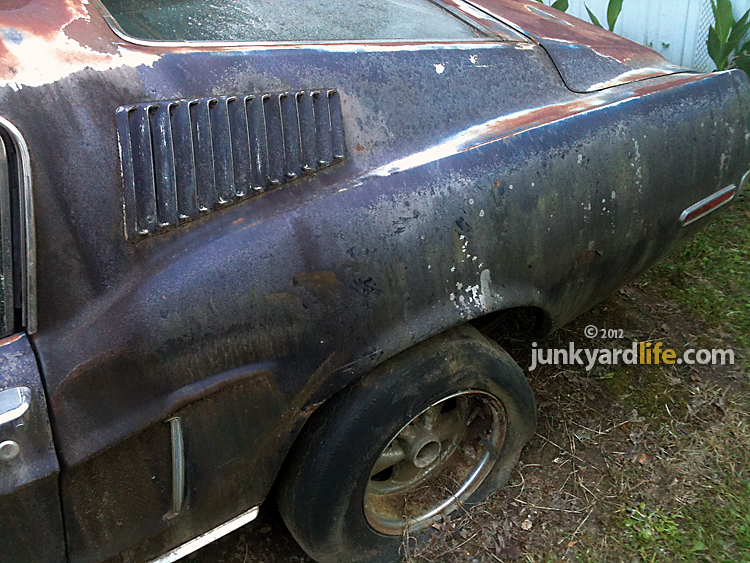 Show us your Pontiac Skybirds, Redbirds and Yellowbirds. The Firebird Esprit was the nicer side of sporty transportation. That why this story is dedicated to them. 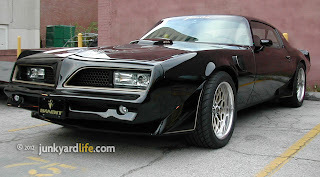 More specifically the other Firebird Esprits that received the sporty appearance package. The Skybird, the Redbird and the Yellowbird. These were the infusion of color Pontiac splashed on the Firebird buying public between 1977 and 1980. 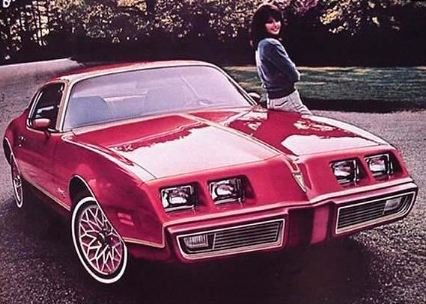 1979 Pontiac Redbird ad targets the ladies. 1978-1979 Red Bird sail panel decal. The Redbird (my personal favorite) appeared the second half of 1978 and the entire production year of 1979. It was Roman Red (code 72) with red Snowflake wheels and other red necessities with a hint of gold to wink at you. Yellow accents highlight the tail light ribs on 1980 Pontiac Yellow Birds. The Yellowbird, although available the entire year in 1980, seems to be the most elusive. It had a unique shade of yellow (code 56) I have never even seen one in person and believe me, I look. 1980 Pontiac Yellow Bird sail panel decal. These cars were not the cheapest Firebirds on the books. They usually had a lot of comfort and power options to drive the window sticker into shock. I have seen them with manual windows and vinyl interior, but more often than not, they were decked out well with velour seats, tilt wheel, air conditioning, cruise control and more. They seemingly had it all. Almost. There was one thing these cars were not known for. Ground pounding performance was out of the question. The fastest Skybird would have to be the 1977 when optioned with the Pontiac 350. After that they were mostly powered by Chevrolet 305s and occasionally a 350. Then in 1979 the fastest Redbird Esprit you could buy had a Pontiac 301. They could also be had with a Chevrolet 305 or a V6. Things only got worse under the hood for the 1980 Yellowbird. Most were V6 powered and if you were lucky, the 301 could be found. 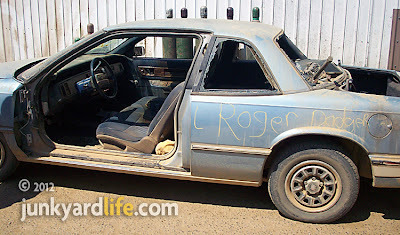 What was wrong with Pontiac? Why were they building a bunch of girly cars? Actually, that’s it exactly. The Firebird Esprit appearance packages were actually made for a female demographic. I know there were and are several exceptions, but its mostly true that whatever is between the fenders is less important to a woman than other factors like fuel mileage and curb appeal. Instead of the famous Phoenix bird, these cars were adorned with something resembling a dove with some groovy 1970’s pinstripes around it. Men were not drawn to these cars and today there are few left. Disclaimer: I am not saying that because women bought them and destroyed them they are hard to find today. There were not that many to begin with and marketed towards a small part of the new car buying public; it only makes sense there are not many left. So I need your stories. Any memory involving someone you knew or like my story below, knew of. Anything is great and I will be thankful to read it. My story was told to me by a gentleman who grew up in a small northeast Alabama town. The daughter of a bigwig (maybe even the owner) at the local Pontiac dealership was pumped up and excited! She had placed an order for a new Skybird! She found herself having to explain again and again to the crowd of young people at the local hang-outs. 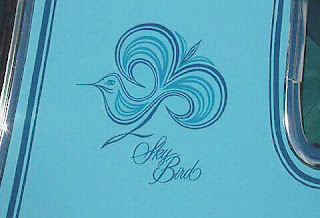 No one knew what a Skybird was. Well, one was on the way and it was hers. One night she arrived in a brand spanking new 1978 Trans Am. It wasn’t even blue, but it did have a bird on the hood. “Is this a Skybird?” she was asked. “No,” she sadly replied. “We couldn’t get one.” There was some issue with availability and she had to “settle” for a new Trans Am. Poor girl. My guess is this was mid-year 1978 and the production of the new Redbird phased out the Skybird package and it was too late to get one. That was the last time that gentleman heard the word “Skybird” until he walked in my office one day and overheard a conversation I was having about one. Sky Birds, Red Birds and Yellow Birds featured a darker shade of the primary paint color along the rocker panels. So what is your Skybird, Redbird, Yellowbird story? I must know! I need your “My Aunt Mable thought it was a nice blue color” stories. I must have your encounters with “that weird red color Firebird”. I need to know how, when and where you somehow crossed paths with that “girly looking” yellow car. Email me at Kidd403@bellsouth.net and let me know your stories! And if you have pictures… I shouldn’t even have to say it. Black and gold Pontiac Trans Ams unite for the 2012 Bandit Run. 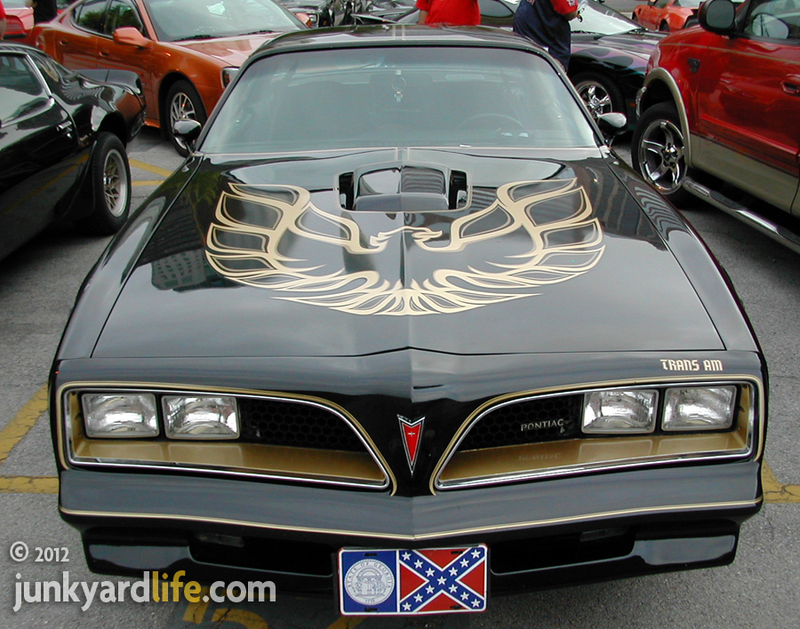 Just watch ol’ Bandit run as "Smokey and the Bandit" fans retrace movie route in 2012 edition of Trans Am road show. This week nearly 250 participants and over 100 cars have signed up to participate in the sixth edition of The Bandit Run. 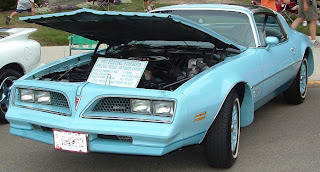 This year the annual event celebrates the 35th anniversary of the original "Bandit" movie and the car that became an international star, a 1977 Pontiac Trans Am. 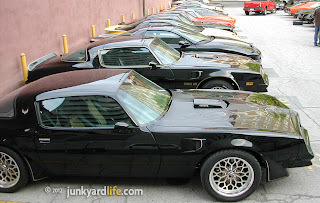 All makes and models, not just Trans Ams, were invited to join the tour, sponsored by Restore a Muscle Car and YearOne. The event kicked off on May 12 in Texarkana, Arkansas and ends in Braselton, Georgia on May 18 at YearOne. 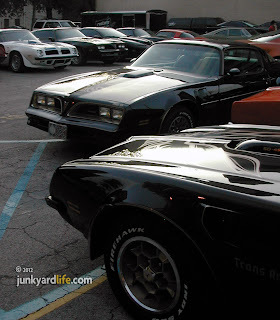 The Trans Am convoy has been known to enjoy triple digit highway speeds along the way to pit stops for food, sightseeing, music and track time in Louisiana, Mississippi and Alabama. The 2012 Bandit Run travels through Birmingham, Alabama on Thursday. The "Smokey and the Bandit" movie was a hit because it was fast, fun and filled with snappy one-liners by a cast of memorable characters. Who can forget Burt Reynolds, as Bo Darville, a.k.a. the "Bandit," at his gear jamming best in his red shirt, cowboy hat and devil-may-care attitude? Or Sally Field, as Carrie, a.k.a. "Frog," at her lovable best shedding her wedding dress in the black and gold Pontiac T/A Special Edition? Jerry Reed hauled the Coors beer as "Snowman" and Jackie Gleason gave his most memorable, over-the-top performance as sheriff Buford T. Justice. The movie and the car became phenomenal success stories. 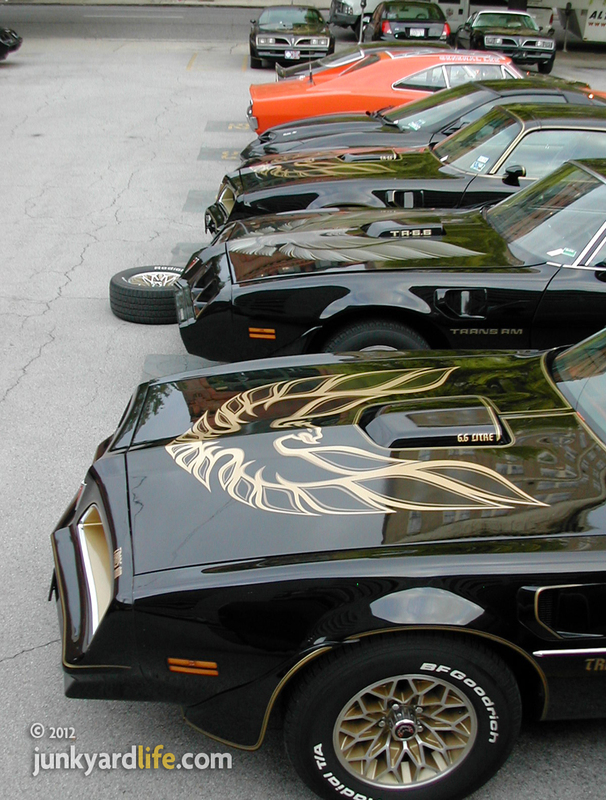 A record number of Pontiac Trans Ams were sold and the movie grossed over $126 million. The original "Bandit" film ignited a Firebird buying frenzy when the film was released on Friday May 27, 1977. Pontiac dealerships were full Saturday morning as "Bandit" wannabes lined up to order their T/As. Many of the cars on the tour are meticulously restored or low-mile originals painted black with gold striping. These are Special Edition Trans Ams (or replicas), similar to the 1977-1981 Pontiacs used in the first two "Smokey and the Bandit" movies. Legions of fans still love the car and the movie. The pedal is to the metal on how far the "Bandit" phenomenon can run. 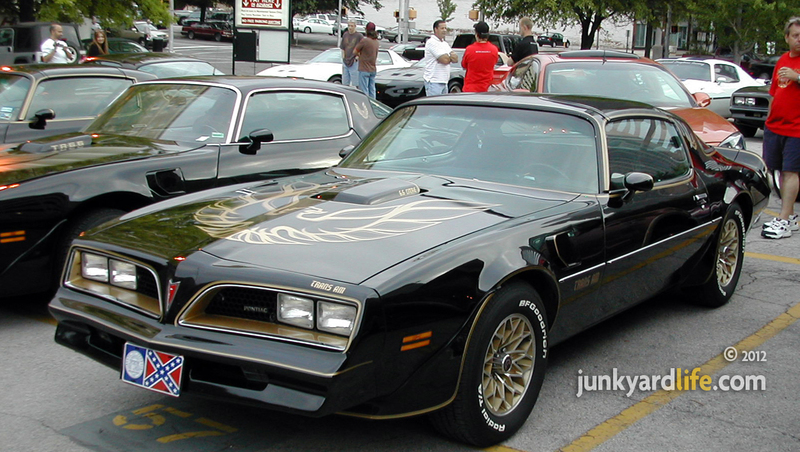 A 1977 Pontiac Trans Am Special Edition at the 2007 Bandit Run. 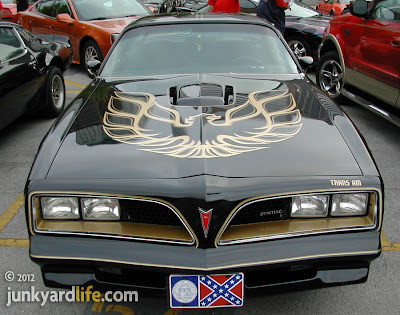 Just like "Smokey and the Bandit," this 1977 Pontiac Trans Am wears a Georgia flag tag on the Bandit Run. A 1979 Pontiac Trans Am WS6 sports the Y84 Special Edition decals on The Bandit Run. 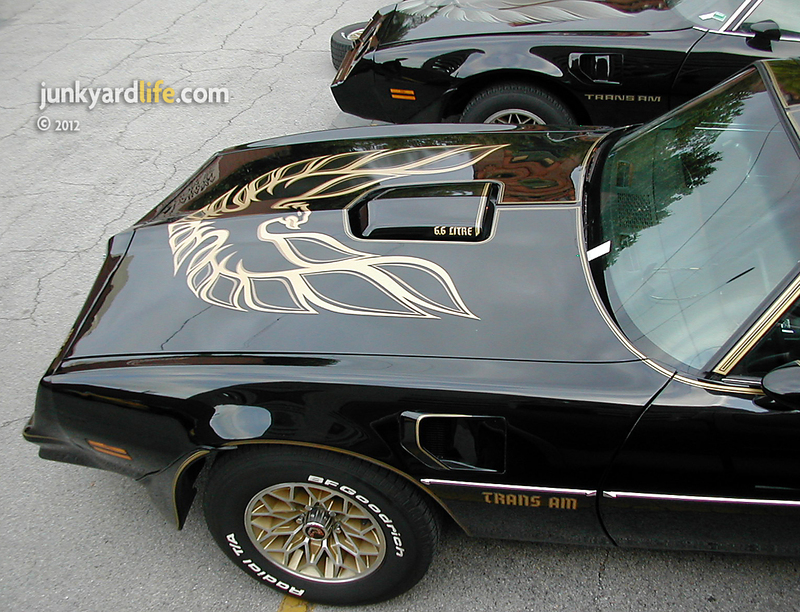 Black and gold Pontiac Trans Ams get the most attention on The Bandit Run. A row of black Pontiac Trans Ams and a 1969 Dodge Charger were on hand at the 2007 Birmingham stop of The Bandit Run. Third Generation (1983-1992) Pontiac Trans Ams join the fun at The Bandit Run. 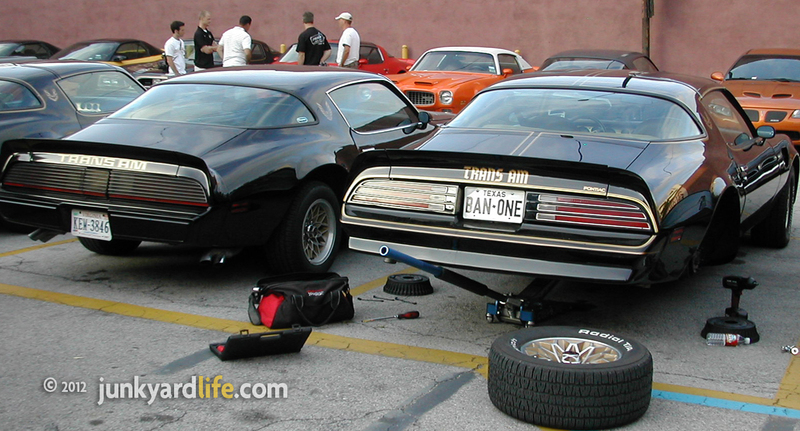 A Fourth Generation Ram Air Pontiac Trans Am, left, at The Bandit Run. 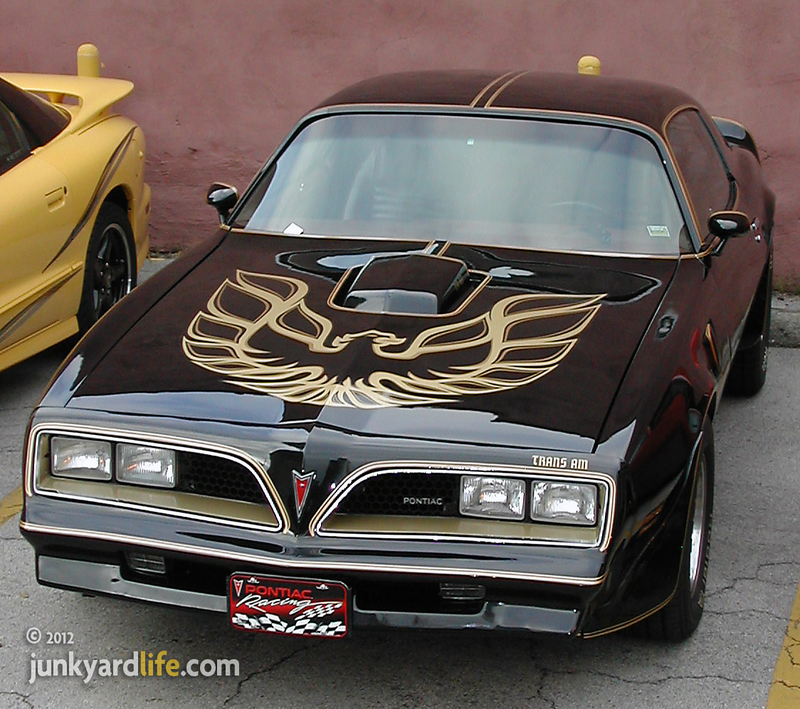 Look for the differences between Year One's Burt Reynold's Edition (BRE) Pontiac Trans Am, left, and the stock T/A. Check out the projector beam headlights on Year One's Burt Reynold's Edition (BRE) Pontiac Trans Am. 2007 Bandit Run participants gathered at The Redmont Hotel in Birmingham. 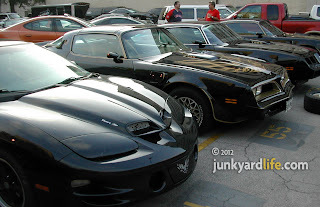 Pontiac Trans Am and "Smokey and the Bandit" fans unite at the 2007 Bandit Run. Year One brought their Ban II Pontiac Trans Am on the 2007 Bandit Run. 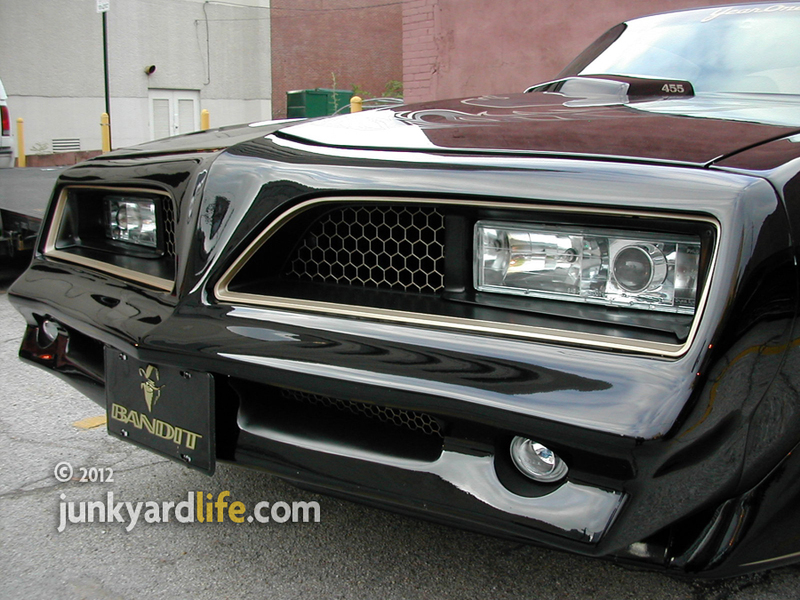 Year One's custom Ban II Pontiac Trans Am has a 550 hp engine. W84 Special Edition 1977 Pontiac Trans Ams included gold decals, striping and unique gold highlights inside and out. Pontiac Trans Am pit stop for repairs during downtime on the 2007 Bandit Run from Texarkana. 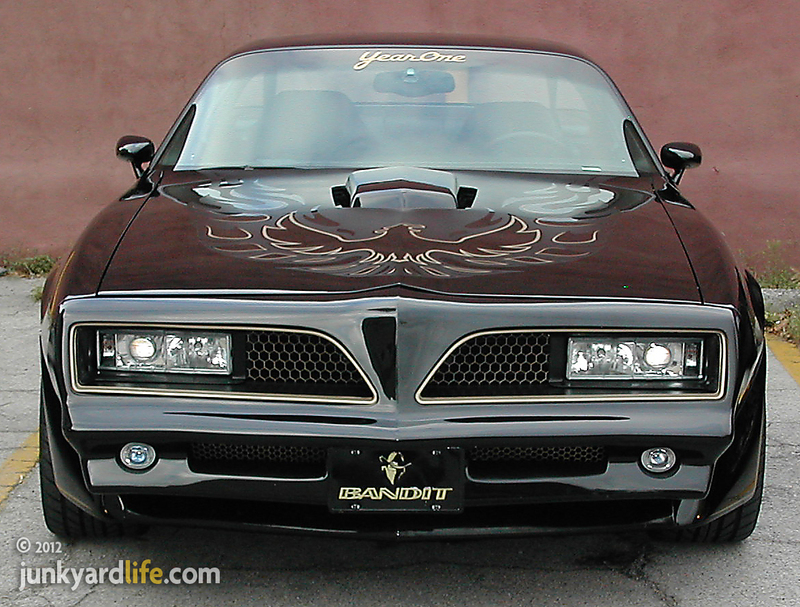 Year One's Burt Reynold's Edition (BRE) Pontiac Trans Am listed for more than $120,000 when it was released in 2007. 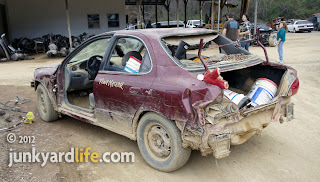 Wrecked but still runs. 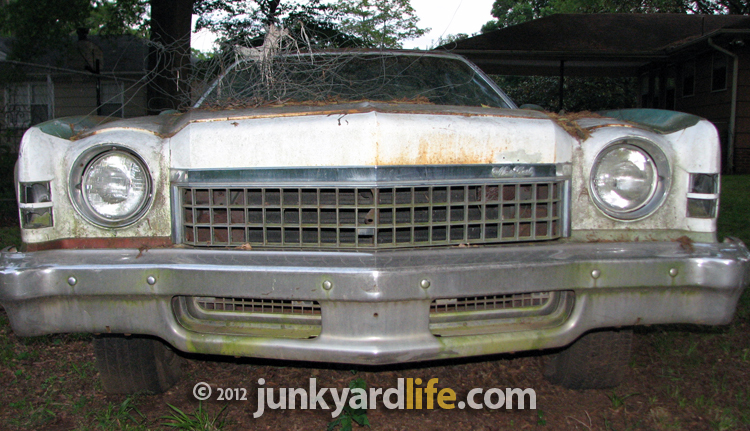 Few cars hold the title as the toughest, battle-scarred S.O.B.s known as the junkyard parts wagon. 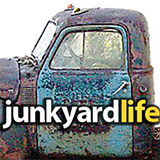 Not much value to anyone but the junkyard man. These unloved, worthless war horses are invaluable at lugging tools and parts without breaking the backs of the dirty, sweaty men and women who work in the yard. Only the doggiest beasts make the cut. Mercedes, BMW, Lexus need not apply. Busted body panels and engines belching smoke are a requirement. Cheap, ugly and willing for abuse. Like a bad date and perfect for navigating a maze of salvage cars and cavernous potholes in a junkyard. 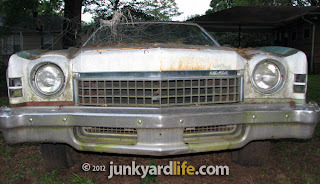 Bumper, doors and headlights removed or destroyed on this junkyard jalopy. 1996 Buick Regal serves junkyard duty at Jefferson County Auto Parts in Alabama. Form follows function these doomsday machines. No doors, no problem. 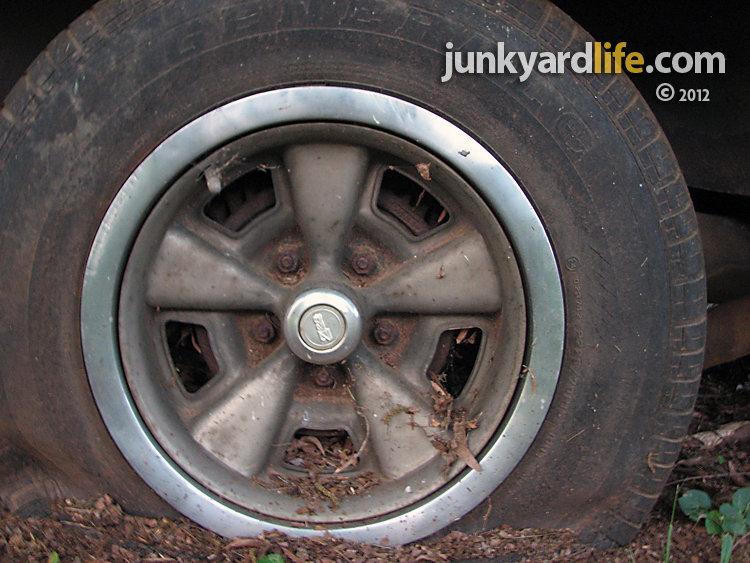 Desired parts are pulled from the junkyard jalopy and sold as necessary. 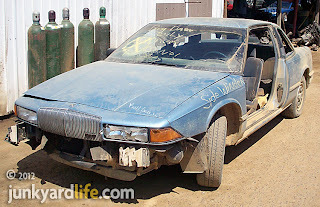 Some body panels are yanked because they have no use. Doors? Optional. Rear glass? Broken intentionally to make grabbing tools and hauling parts easier. Trunk lid? Really, you had to ask? 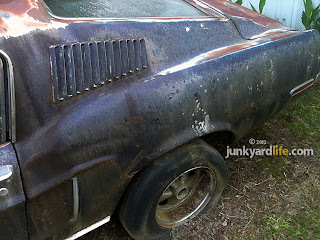 A car transforms into a Car-Camino without a deck lid. Perfect for hauling a Turbo 350 transmission and torque converter. The battery is the most valuable remaining part on these mutilated cars. You will find the keys in the ignition, unless the steering column is jacked up and the jalopy cranks with a screw driver. Jump in and go. 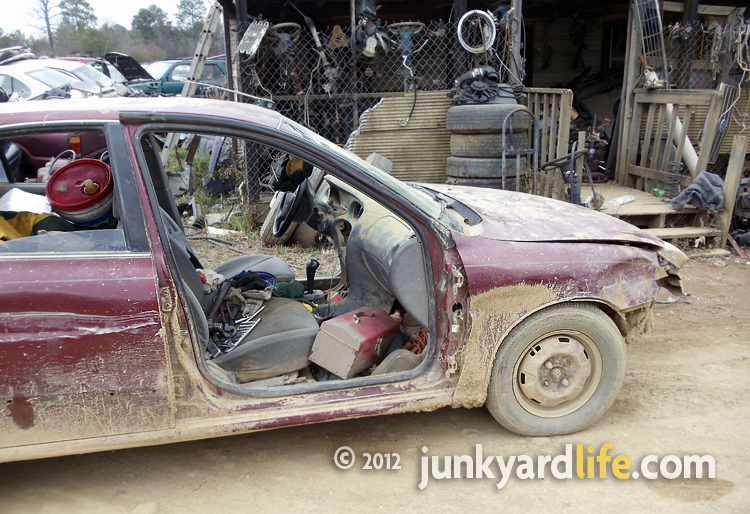 Junkyard life continues for these cars as long as the junkyard man wants to keep them running. He has all the parts after all. "Pony Machine" scrawled on this junkyard beast of burden. This photo does not do justice to the incredible swivel seats. The flip of a lever actually turned the seat 90-degrees to allow the driver or passenger to sit down without “climbing” in. This shot does show the power window and lock options. This brochure photo for 1973 Monte Carlos gives a better idea of the Swivel Buckets. Notice the ad color was green. Green was still popular in 1974, although it was on the downhill slide. By 1980, green was associated with grandmothers and bridge players. I would have bought it! Personal Luxury was the craze. Pontiac’s Grand Prix led the way in 1969 for the taste of a two door model that ran like a muscle car and felt like a larger car. Chevrolet answered the call with the 1970 Monte Carlo. You could have had a V8, and you certainly did, you power hungry consumer, you. A six cylinder was not an option. Don’t even ask. A couple of 350 C.I.D’s , a 400 small block, a 402, and a couple of 454s were on the option list, including an LS6 450-horsepower ground pounder in the Super Sport models. Wearing small SS454 badges, it was discreet and dangerous. Our first surprise was a near perfect set of 1970 Camaro Z28 wheels on this Monte. Although they did not come on this car from the beginning, they still add a muscular stance to an already good looking car. Any chance of the Camaro still hanging around? Maybe its wearing the Monte Carlo’s wheels. Chevy produced the first generation Monte Carlo from 1970-1972, giving way to a major redesign in 1973. The first of GM’s new “Colonnade” body style didn’t really go over well at first. They were slower and heavier than their older brothers due to government mandated safety standards. Also, rising insurance rates and fuel costs were attempting to kill the muscle car. 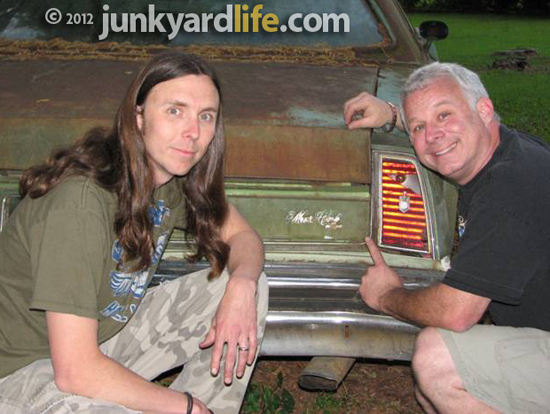 We still love them, so when The Junkyard Life guys spotted this 1974 Monte Carlo we had to investigate! Was it a 454? It wasn’t, but still we hit Junkyard Green Gold on this one! Ironically, that was actually a color option for 1973-74 Monte Carlos. This baby was decked out too! 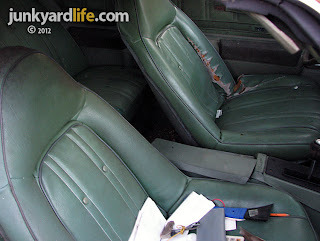 It had seemingly everything, including the way cool-way limited-way hard to find swivel bucket seats! In green even. Pause to take recovering breath here, you weird forgotten option fans, like us.! It was also packing tilt wheel, cruise control, power windows, air conditioning power locks and originally had a Landau top. 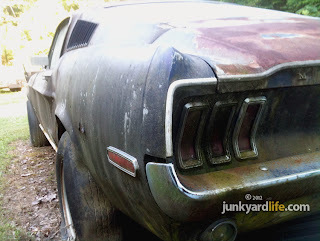 Lucky for us Junkyard Life guys, someone ripped it off years ago prolonging the cars life due to the rust vinyl tops promote. Another forgotten weird option was the “Sky Roof” –the predecessor to the sun roof. In a Monte Carlo? Yes! It was in the brochure! Sky roof baby! 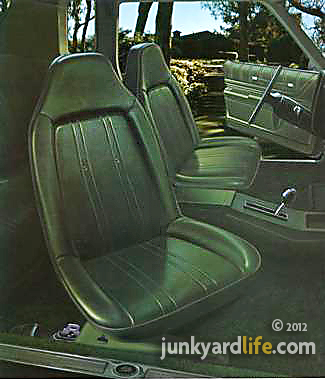 GM touted it in their 1973 brochures. Our first glance from the rear hinted this car was special. Good hint! 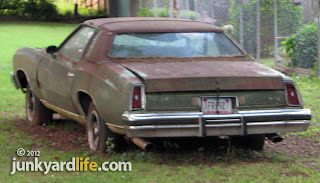 How many 1974 Monte Carlos were built? Selling 312,217 Monte Carlos in two trim levels, the S Coupe and the Landau, one would incorrectly assume we would see more of these. We don’t. We wish. Can this one be ours? We wish that too! Dear Prudence, what have you become? The swoopy lines of the 1974 Monte Carlo look great when accented with the thin pin stripe following the body lines. 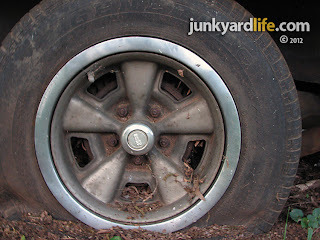 My family had two of these along the way, including one that was Hugger Orange with Rally Wheels – the same wheel I suspect this car was wearing in its younger years. I (Ron) point out the rear taillights and classy Monte Carlo emblem. This was right before Jody and I hit the dirt to look for other goodies like the optional Posi-traction rear end and rear sway bar (inconclusive). Speaking of which, in 1972 John Delorean was finishing his run as a GM executive and ordered the 1973 Monte Carlo to have a world class handling package. It was to “have the cornering abilities of its European counterparts” as Chevrolet claimed in their brochures. 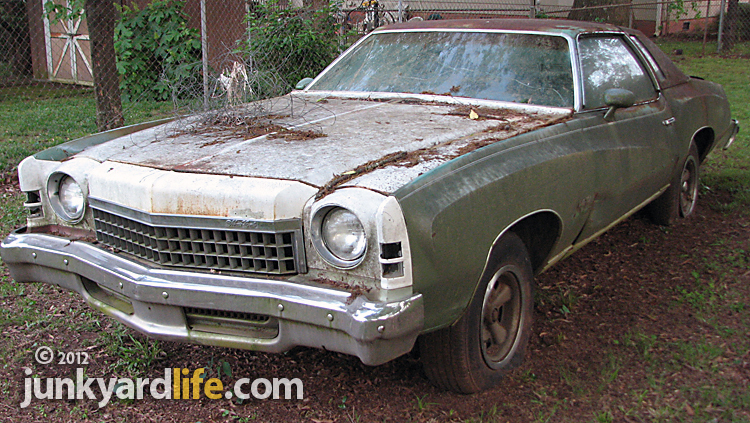 This Monte Carlo wears a replacement header panel from a white donor car. 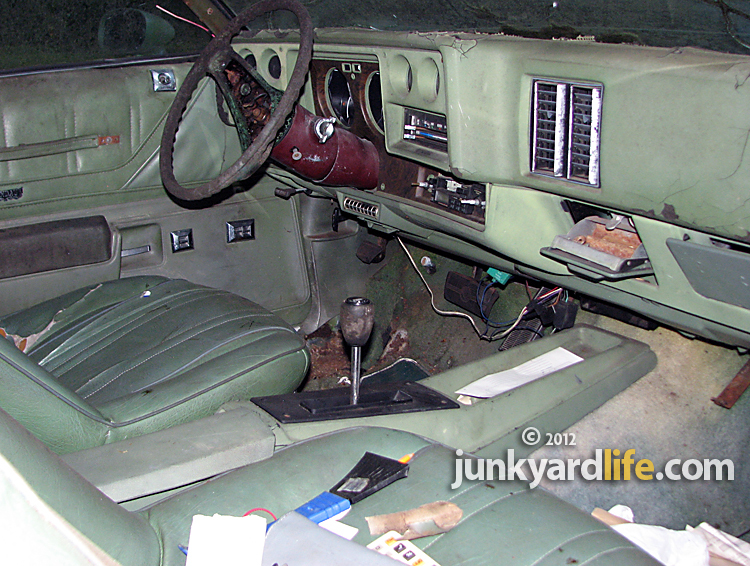 Last look at the nearly 40-year-old swivel seat design in the ’74 Monte Carlo.